I remember first learning about the difference between needs and wants in elementary school. We learned that we need things like food, air, shelter, water and love to survive and we learned that wants are things like toys, brand name clothing, fancy cars etc. I later learned about Maslow’s Hierarchy of Needs which expanded my context further but I still didn’t put a lot of thought into the specific needs that filled up each category. 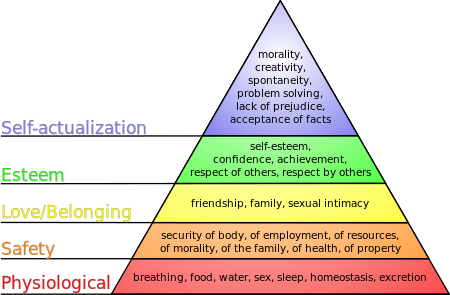 I just tried to figure out where I was on the chart and knew I wasn’t at the self-actualization stage yet but I was above the physiological section. Then, just a few weeks ago, I was given a needs inventory handout from the Center for Nonviolent Communication in a Creator’s Code Creation Circle meeting. We were learning how we could meet our needs in clean and clear ways which first meant we had to understand our needs. The list of needs blew me away! I found it very comprehensive and in many cases I hadn’t previously considered the things listed as needs at all. In my mind they were wants. They are nice to have if I have extra time to focus on them, but not necessary for my overall well being. As I read through the list, I was delighted to see that much of the self care I do is actually helping to meet various needs and this list is just further proof that I NEED to practice self care regularly to operate at my peak performance! My husband calls this high maintenance, and maybe it can be seen as that, but all I know is I’m much happier when my needs are met. 1. 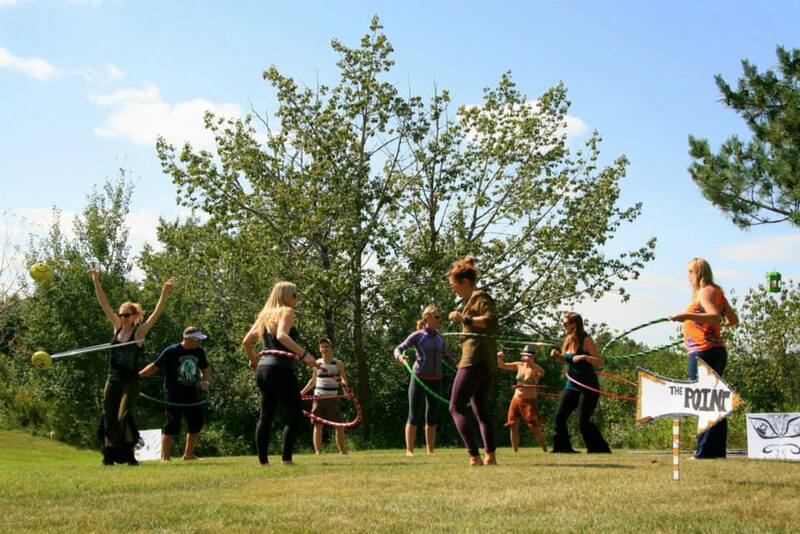 Community – Hooping has connected me to a local and international group of beautiful souls. Any city I visit, I try to hit up a hoop jam so I can make new friends. It’s amazing being able to connect with a group of strangers wherever you go, where you feel like you belong almost immediately. I didn’t feel this sense of community on a large scale growing up as I wasn’t part of religious organizations and wasn’t involved in many extra curricular activities. As a hooper, I definitely feel the love and connection that comes from being part of an amazing community. 2. Authenticity – The hoop invites me to be my authentic self. To move my body in such a way that expresses exactly how I’m feeling in that moment. It can be challenging to be authentic in a world that encourages you to conform, but the hoop continues to teach me how to be myself. I knew it was important to practice being me, but I didn’t realize that I NEED to be me! 3. Play – When I saw this one on the list, my first thought was, well play is good for people who aren’t that busy, but most people aren’t going to make time for it, so it can’t be that important. Good thing I’m not what I think most people are like! Hooping is all about play and I make it a priority all the time. Play brings fun and laughter and silliniess. I guess we need all that too. Who knew that playing with a plastic circle was so important? When we play, we’re actually meeting a need! 4. Inspiration – It can be easy to get caught up in the day to day actvities of life, but what is the point of living if you’re not inspired? Watching other hoopers bust out is always inspiring and gives me motivation to grow and expand. I can now see this is a need because when I feel I’m in a rut, I head over to YouTube and watch videos of my favourite hoopers to kick my creativity into high gear. I need that to keep going some days. 5. Creativity – And speaking of creativity, that need made the list too. I often think of people as either creative or analytical. Before recognizing creativity as a need, I thought about it as a treat if I completed all the things on my to-do list first. Now that I know creativity is a need, I will give myself even more time to play and explore in my hoop. I love taking time to ask what if, like the time I asked what if I try to combine sustained spinning with breaks & reversals? The results were great and I even based a workshop on it! I would have never discovered that combination had I not taken time to nurture my creativity. 6. Learning – I appreciate being able to learn but didn’t think this was something I needed. The hoop teaches me so much. I’m not just learning tricks and developing my flow, I’m also learning about life. Some of my favourite hoop life lessons are captured here. And what’s more, when I teach, I learn. Both kids and adults teach me so much as I teach them. The learning never stops, I knew this but again, never thought I needed to learn to be satisfied in life. 7. Movement – This one might be more obvious but I just wanted to add that I’ve recently gained some weight as the result of meeting a need to experience joy this summer. I ate and drank everything I wanted! I would like to feel healthier now and have been playing with what I call Hoop Aerobics. Doing lunges, squats, toe lifts etc while hooping. It’s the only way I can really enjoy myself while “exercising” and exercise has to be fun for me or I won’t do it. It’s been great so far and I’m excited to keep going with it. One rule I’ve given myself that will be sure to get me fit in no time is that everytime I drop my hoop, I have to do a burpee! Or perhaps, I’ll just develop more core control with the hoop to avoid doing burpees, we’ll see. A shot of a group I was teaching at a small music festival a few weeks back. I see a lot of needs being met – play, learning, exercise, connection and more! In addition to learning about the types of needs we have, I also learned that we can always tell when our needs aren’t being met because we are unhappy in some way. I think back to before I started hooping over six years ago and can honestly say I’m a much happier person now. I consider hooping to be one of my essential self care practices and understand why it fills me up, it’s because it meets so many of my needs. Hooping truly fulfills me! It allows me to feel my core desired feelings (abundance, support, connection, flow and joyful radiance) each and every day. I even spotted some of my core desired feelings on the needs list, proving to me that daily connection and joy are even more important than I previously thought. What a beautiful gift I’ve received from this little plastic circle. Last week, I had the opportunity to teach a beautiful group of 32 12 – 15 year old girls at NAIT’s G-Force Summer Camp. The camp focuses on personal empowerment and I love the opportunity to not only teach hoop dance, but to use the hoop as a metaphor for teaching important life lessons. This is my third year back at the camp and I’m always astounded at the girls’ wisdom. I started the workshop by asking each girl to share her name and one characteristic of a strong woman. Their answers were amazing and they even addressed some of my ideas of a what a strong woman is. To them strong women are empathetic, intelligent, they follow their dreams, they know what they want, they are stubborn! (I think she meant someone who sets her boundaries and doesn’t give into peer pressure), they don’t care what anyone else thinks about them, they have high self esteem, they are loving, they are compassionate, they are beautiful on the inside, they are brave and they ask for help when they need it. They listed more characteristincs, but these are the only ones I can recall. It truly fills my heart with joy to see that there are so many aware and awake young woman growing up in the world today. I’d like to think that I would have given an answer like theirs when I younger, but I truly don’t know how I would have answered. Today though, I do have some solid thoughts about what a strong woman is. Below are the characteristics of strong women we touched on in the workshop. A strong woman only focuses on the three things she can control in her life – her thoughts, her feelings and her actions. A strong woman does not spend time worrying about what other people think about her or about what other people are doing. She chooses to create her reality, she explores her feelings, she chooses to be aware of her thoughts and will consciously choose to change them if there is any judgement of self or others. I asked the girls to pay attention to their thoughts during the workshop. To notice if any self judgement creeped in if there was a trick they weren’t picking up as quickly as some of the other girls. I invited them to shift their thoughts from self judgement to self love, instead of saying something like “I’m stupid and I can’t do this”, I invited them to shift to “I can do this and I just haven’t figured it out yet”. Our thoughts are so powerful and we need to choose them wisely. It is only when we are aware of the thoughts in the first place that we can choose to change them. When we accept where we are, we can redirect that misused energy to become more productive. We’ll likely figure out a trick faster when we’re not judging ourselves for not getting it right away. Here’s me, expressing myself at a recent music festival and being brave enough to share it with the real world. A strong woman is brave. She goes after what she wants, even if takes a lot of time or if she has to stand up against what others want her to do or be. She walks her path and allows herself to be seen, even if it feels uncomfortable, she is committed to living her truth. She follows her heart. I shared with the girls that when you see a woman like this, you will likely be attracted to her because she is confident. As a teen, I wanted to conform but also wanted so badly to express myself at the same time. I encouraged the girls to be brave in the workshop and use the hoop as a tool to express themselves and the emotions they’re feeling. I encouraged them to find a healthy way to express their emotions in their regular life, because emotions are completely normal and they just want to be acknowledged and felt, not to be pushed away or ignored. I encouraged them to find something that makes them as happy as hooping makes me and use that as a tool for self expression. A strong woman asks for support. She recognizes when she is struggling and asks for help. In my experience, this is a tough one for so many people, something I’m only starting to really explore myself. I think we often feel like unless we know exactly what we need, we can’t ask for help. The truth is if we knew what we needed, we’d probably try to help ourselves. If we just allowed ourselves to be vulnerable and access the vast support networks we likely have, we’d be doing ourselves such a service. I think there can be a stigma around asking for help and I believe that needs to change. I asked the girls to not be shy to ask for help in this workshop if they needed it. I hope that this gave them the opportunity to practice asking for help in a small way so they could feel more comfortable asking for help when they needed it in bigger ways, like when they were feeling depressed, isolated or heartbroken sometime in the future. Many of the girls did ask and I can only hope this reinforces that it is not a weakness to seek support. There are so many characteristics of strong women that I could write and teach about it’s hard to narrow it down to just a few. I love being able to start the dialogue about this topic so the girls can begin to explore and appreciate all the ways to be a strong woman. I think they are already well on their way. I know it’s best practice to blog weekly but that is not something I can keep up with so I gave myself a more realistic goal of once a month. That seemed much more doable, and was for almost two years. Then I missed a month. Then two. Then three. Now I feel all this pressure to write this epic post and I don’t feel like anything is good enough or interesting enough! I know though, that I can glean a lot of lessons from this whole experience because this is just a reflection of how I act in other areas of my life. That whole mirror thing, you know? I’ve got an expectation of what I should be doing, feel guilty when I don’t do it and then feel some resistance to getting started again because it feels too big and insurmountable. I just need to start writing again. Get back on the wagon, so to speak. Baby steps. One step. Just one word. It’s not all or nothing. How many times in life do we take an all or nothing attitude? How often does that actually work? I tried an all or nothing attitude and I ended up getting burnt out. In fact, I’m still recovering from adrenal fatigue syndrome because I pushed myself too hard for too long. Working full time, building my business and still trying to have an active social life. It became too much and I swung from one side of the pendulum (the crazy busy side) to the other (crash & burn). When I swung back to the non-busy side I guess my blog fell to the wayside, along with other non-essential activities that previously took up my time. It all makes sense though, when I think about how my theme for this year is balance. I realize that perfect balance is a myth and can never be truly achieved, it’s more like managing a juggling act or finding a flow or rhythym in life. What I’m looking for, is a way to manage it all. I’ve learned that I can still do it all if give myself more downtime. At the same time, I realize that I can’t actually do it ALL, but I can do a little bit of it all if I cut out the non-important things. Reprioritize. Set boundaries. I’ve started asking myself how something will make me feel before I do it, and if it doesn’t align with one of my core desired feelings, then I don’t do it. Simple as that. My pendulum is swinging back to centre. You can explore your own core desired feelings, check out Danielle LaPorte’s “Desire Map“. It’ll totally change the way you plan your life, it’s already having a huge impact on mine. My pendulum is finally swinging back to the middle after a few months of rest, reprioritizing and relaxation. I may be closer to finding that elusive balance than I thought. And I guess I had a blog post in me after all.